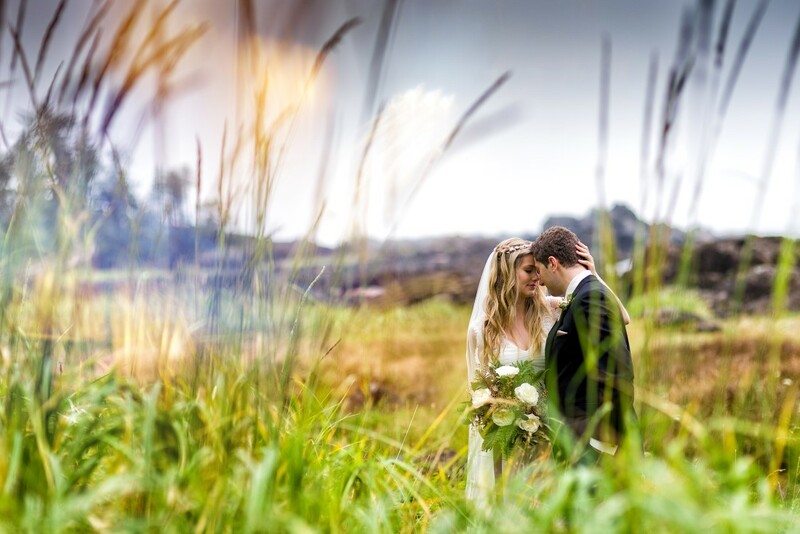 Black Rock Oceanfront Resort in Ucluelet hosted this beautiful wedding. Liz & Alex knew they wanted the perfect combination of Vancouver Island rainforest and beach and they found it! It was bound to happen sooner or later…we are so happy that Liz & Alex are our first E-harmony couple! They bonded online over common interests and met finally, in person, at a coffee shop in Vancouver. Liz says the moment she saw Alex, and his smile at her, she knew he was the one. As for the proposal, Alex was all over that. He carefully planned the moment on the Capilano suspension bridge but had not counted on Liz being afraid of the heights. As Alex desperately tried to get her to stop and pay attention at the perfect spot, Liz was equally desperate in her attempt to leave the bridge! Liz’s wish to flee came to a sudden halt when she caught a glimpse of the ring and quickly accepted Alex’s proposal. Liz & Alex knew they wanted the perfect combination of Vancouver Island rainforest and beach for their wedding day. When it came to planning their wedding, Liz and Alex found they had something else in common – a love for the beach. So their decision to get married at Black Rock Oceanfront Resort in Ucluelet was an easy one for them. The resort had the perfect combination of Vancouver Island rain forest and beach as well as the ocean view from the Wine Cellar. Wedding Worthy: Alex’s Ted Baker sneakers with blue laces! You are invited to another Black Rock Oceanfront Resort love story! Something Borrowed: A custom ring from Juvelisto which combined grandparents and parents wedding bands and birthstone rings – representing the love in the family as the grandparents and parents have been married a long time. Décor Palette: Elements of the West Coast were the inspiration so ferns could be found everywhere including a beautiful live fern sweetheart table. A tree motif was used on the amazing ice luge, cookie favours and the invitation suite. Water elements were also used on tables and moss lined the ceremony aisle. The best part according to Alex & Liz? The West Coast s’mores bar!